Most cases of skin cancer are caused by Ultraviolet (UV) radiation which comes from the sun. The strength of the sun's ultraviolet (UV) radiation is expressed as a Solar UV Index or Sun Index. The UV Index tells us the level of UV radiation that is expected at the earthâ€™s surface. It is a scale that runs from zero upwards. The higher the level the less time it takes the skin to burn and the greater the risk of skin damage which can lead to skin cancer. 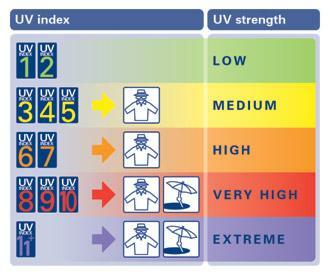 If the UV Index is 3 or more it is important to follow the SunSmart code. The Irish Cancer Society advises that, when in Ireland, we follow the SunSmart code from April to September to protect our skin. However, if the UV Index is 3 or more, make sure to take extra care. The following table shows at which UV Index level we should protect ourselves through clothing and/or sun screen and when we should also seek shade.